And just like that the regular season is over. The Orangemen, who jumped out to an impressive 18-0 start (second best in school history), certainly made it interesting. After losing six of eight games in Big East play from January 17th to February 12th, the Syracuse Orangemen rattled off five straight victories to conclude the regular season 12-6 in Big East play, 25-6 overall. Way back on September 30th in Part III of The Cuse Connection's Basketball Preview I predicted a 23-8 overall record and a 13-5 mark in Big East play. Had it not been for that shocking blowout loss to Seton Hall in the Carrier Dome we would have been right on the money with that prediction. We also would have been playing Thursday night as the 3 seed instead of in the afternoon session as a 4 seed, but I digress. Fortunately for the Cuse, they are playing some of their best basketball of the season right now. 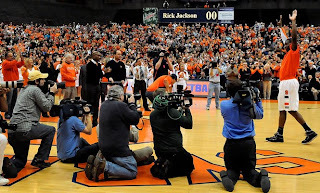 Behind Rick Jackson and a rejuvenated Scoop Jardine the Orangemen finished the 2010-11 regular season campaign with two road wins on the hostile "campuses" of Georgetown and Villanova and capped Rick Jackson Night with the largest margin of victory in Big East Conference history. On Saturday evening Syracuse thrashed the DePaul Blue Demons 107-59. They shot the ball an absolutely ridiculous 71.4% from the floor and an even more astounding 77.8% from beyond the 3-point arc (7 of 9), by far the best percentage from long range this year. Syracuse also shot 90.9% from the foul line. While it is unlikely to see the team shoot 71.4% from the floor again this season (or possibly even next season! ), every Syracuse fan has to be excited by the fact that the offense is clicking right now and that the defense is starting to get back to business. Scoop Jardine, who was a pariah for much of January and some of February, is really turning it on right now. Jardine is regaining the form that helped Syracuse jump out to that great 18-0 start and finished his season with 14 points on 6 of 7 shooting from the floor on Saturday. Even more importantly he had zero turnovers in the game, first time this season. After turning the ball over at an alarming rate, Scoop has just 1 turnover in his last two games. During the same stretch Scoop has 15 assists. Is a 15:1 assist-to-turnover ratio any good? In his final game in the Carrier Dome Rick Jackson put on a show. In 27 minutes of action Jackson finished with 14 points (on 7 of 10 shooting from the floor) 7 rebounds and 4 blocks while committing just one turnover. Jackson also chipped in two assists and a steal for the Orangemen to cap off a tremendous regular season. Even Fab Melo, the forgotten freshman center, got in on the action Saturday! Melo played 16 minutes, the most since December 20th against Morgan State and more than his last six games combined. Making use of his minutes, Fab Melo was an astounding 5 for 5 from the floor for a season high 10 points and grabbed six rebounds, one less than his season high. Better late than never Fab! Yesterday it was reported that Rick Jackson was named Big East Defensive Player of the Year. Jackson led the conference in blocks, rebounds and field goal percentage, however the same coaches who recognized Jackson as the best defensive player in the best conference in college basketball also saw fit to leave him for 1st team All-Big East honors. Instead they opted to go with six guards! Looks like the coaches really went out of their way to keep Jackson off of the 1st team. Oh by the way, Rick Jackson also posted the most double-double's in the Conference this season, no big deal. While Rick was named to the All-Big East Second team, Kris Joseph received All-Big East Third team honors and Scoop Jardine was named to the Big East Honorable Mention squad.